The Angles app for iPhone from Dan Hassin, also referred to as simply “Angles,” is a stylish variation on the familiar Breakout-style paddleball game. 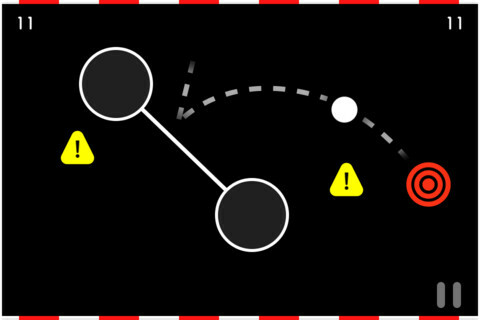 The player bounces a ball towards targets with a platform, which can be tilted and stretched with the thumbs. The rules and gameplay are easy enough to learn, and it’s a good game for all ages and abilities. Aesthetically, The Angles Game is fantastic on the iPhone. I love the music, and although the graphics are comprised of mostly circles and lines, they look elegant and crafted rather than clumsy or amateur – a stylish update to the Pong look. The app presents a compelling argument that, in terms of visuals, less is more. As far as gameplay, however, less may not be more. Angles advertises itself as simple to learn but difficult to master, which is certainly true. Some players will appreciate the game’s simplicity, while others may get easily bored. It’s a fun experience, but not the sort of game you play for hours at a time. 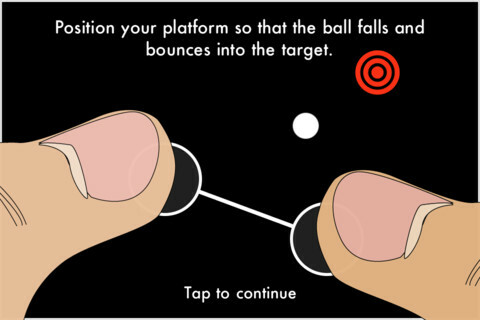 Angles presents a few unusual twists on the standard bouncy-ball game. The first is that the game begins with walls on all four sides, so you cannot knock the ball out of bounds. If you’re used to the bottomless pit common to Breakout and its successors, you may breathe a sigh of relief when you discover you can drop the ball. Or you may find it makes the game too easy, since you can use the platform and walls to herd the ball towards its target. As the game progresses, however, walls disappear and reappear, forcing you to rethink this strategy. If you try to push the ball using the platform, you run the risk of the ball defying physics and falling through. I can’t tell if this was deliberately programmed into the game, or if it’s a bug that was turned into a feature; my suspicion is that it’s the latter. The intro advises you not to push the ball, but doesn’t explain this particular consequence, so it took a bit of playing before I realized why the ball sometimes fell through the platform. Before I noticed the pattern, it seemed like a serious flaw; now that I’m aware of it, it’s another element of gameplay I can avoid or exploit. Even with its flaws, The Angles Game is worth a download on your iPhone, especially with its 99-cent price tag. It’s attractive and easy to pick up, and a wonderful example of what a simple idea and simple design can accomplish. AppSafari review of The Angles Game was written by Katherine Thorne on November 1st, 2011 and categorized under Action, App Store, Games, Physics Based, Puzzler. Page viewed 3986 times, 1 so far today. Need help on using these apps? Please read the Help Page.